The House with a Clock in Its Walls is very entertaining. Fast-paced and imaginative, this beguiling gem of a family-friendly horror yarn is an engaging bit of supernatural goofiness I enjoyed immensely. Based on the best-selling book by John Bellairs and featuring a solid script by “Supernatural” mastermind Eric Kripke and surprisingly nimble direction from Cabin Fever and Hostel impresario Eli Roth, this movie is a blast, and I have a sneakily sinister suspicion audiences of all ages are undoubtedly going to feel the same. At least that’s my hope. Roth and Kripke remember that horror can be for kids and adults alike, neither of them skimping on the scares or the wonderment as far as this magical piece of pop entertainment is concerned. The pair strike a delicate balance, maintaining their PG rating and making things suitable for younger viewers while at the same time treating both them and their parents with a level of intelligent respect that’s rare for live action horror-fantasies in this vein. It puts recent efforts like 2015’s Goosebumps (which incidentally also starred Jack Black, the erstwhile headliner here) to shame while at the same time reminding me of past favorites like Gremlins, Adventures in Babysitting, The Witches and even that first adventure of everyone’s favorite boy wizard Harry Potter and the Sorcerer’s Stone. Not that I’m proclaiming Roth and Kripke’s adaptation an instant classic or anything. It’s a little overly comical, and not all of the individual elements fueling the story come together as nicely as they maybe could have. While an energetically wicked Kyle MacLachlan is having an obvious ball portraying the film’s primary villain, he’s also not utilized particularly well and as such he’s just not that threatening. Also problematic is Roth’s staging of the climactic sequences, the director allowing the special effects to overwhelm the story in a way that lessens the emotional impact of the life or death decisions our heroes are forced to make. As to that plot, the basic scenario revolves around the recently orphaned Lewis Barnavelt (Owen Vaccaro). It is 1955 and he finds himself relocated to the sleepy Midwest town of New Zebedee to live with his eccentric Uncle Jonathan (Black) in his creepy gated mansion which he’s fairly certain has a mind of its own. Lewis is also introduced to his Uncle’s best friend and neighbor Florence Zimmerman (Cate Blanchett), the larger-than-life woman showcasing a kooky affinity for the color purple and a delicious ability to make the best chocolate chip cookies the boy has ever tasted. Turns out, both Jonathan and Florence have magical abilities. More, they’re willing to teach Lewis the tricks of the trade and, if he shows enough interest and is willing to study hard, are going to help him become a full-fledged warlock if he so desires. But the pair is also hiding a terrifying secret, and it’s lurking inside the very house in which the boy now lives. Years earlier powerful dark warlock Isaac Izard (MacLachlan) hid a devilish clock inside the walls, and Jonathan and Florence must find it before it strikes its final doomsday gong. Lewis is naturally the key to solving this mystery, the kid both the reasons things begin to accelerate towards apocalypse as well as the one who is most likely to save the entire Earth from certain annihilation. In the end each hero learns important life lessons about family, love, friendship and responsibility that will affect them for the rest of their lives. Most notably, Florence is forced to face down her tragic past and rediscover powers she’d allowed to go dormant in the aftermath of WWII, Kripke’s scripting of this and other moments never hesitating to go into some pretty complex territory. But he also assumes his audience, no matter their age, will be smart enough to put many of the pieces of Lewis, Arthur and Florence’s respective stories together for themselves, never spoon-feeding what is going on which then allows the emotional components to become all the more powerful. It’s pretty terrific, and Roth handles the various facets of this tale with confident gusto. Even as cartoonish and silly as some of it can be, which honestly is a little par for the course for kid-centric thrillers such as this, the filmmaker continues to put his characters first, allowing them to craft full-bodied, three-dimensional portraits overflowing in honest human emotion. Also, as good as Black is (he’s pretty wonderful) and as enchanting as newcomer Vaccaro might be (he’s a spunky delight), Blanchett takes command of the movie and steals every single scene she’s in. Her flamboyant exuberance is intoxicating, and I’d honestly love a spin-off tale following Florence in her day-to-day life picking just the right purple outfit and perfecting her chocolate cookie recipe while battling supernatural evil in her spare time. Roth has made a few movies I’ve liked, most notably Cabin Fever and The Green Inferno, but none of his efforts have ever struck me as pieces of exploitive horror entertainment I’d ever watch more than once. 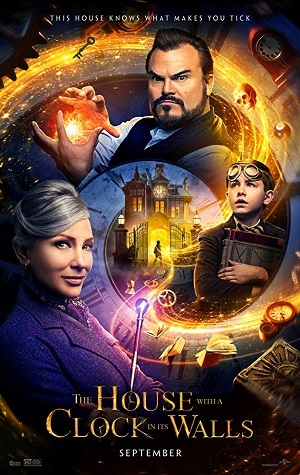 The House with a Clock in Its Walls is the first feature of his I can’t wait to return to, and the filmmaker being forced to deliver a PG rating seems to have focused him behind the camera like it never has before. As slight this movie might be, it’s just so much gosh darn fun its various shortcomings thankfully don’t add up to much, Roth finally making a motion picture I can heartily recommend with no reservations whatsoever.